INDUSTRY.co.id - Jakarta - PT Pupuk Indonesia (Persero) symbolically handed over the renovation of houses to 48 veterans of the Republic of Indonesia in the series of State-Owned Enterprises for 2017 in Jakarta for West Java which coincided with the moment of the 72nd anniversary of RI. 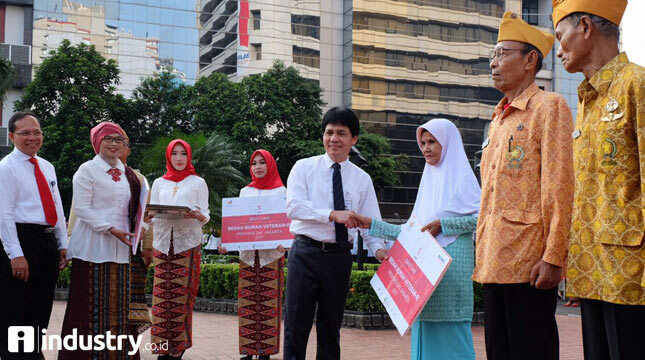 Delivery of assistance is done by a special Staff Minister of State-Owned Enterprises Ahmad Bambang and Director of PT Pupuk Indonesia (Persero) Aas Asikin Idat to Pariyem wife of Alm. Sukijo who is one of the Veteran fighters in Jakarta, after the Memorial Ceremony August 17 at the Ministry of SOEs, Thursday (17/08/2017). The renovation of this house is based on a survey of 48 veterans owned homes found that most of the houses are unfit for habitation. "Originally, Pupuk Indonesia is only responsible for renovation in DKI Jakarta area. However, in its development, this Veteran House Surgery apart from DKI Jakarta also includes several houses in West Java. In running this program, all state-owned enterprises in cooperation with Kodam Jaya and Kodam Siliwangi, "said Aas. Aas added that the cost of renovation of each house is estimated around Rp. 40 million per house. This program will be carried out gradually from July to December 2017 by involving teams from Kodam Jaya and Kodam Siliwangi, and Pupuk Indonesia has signed a memorandum of understanding on the implementation of surgical house with Kodam Siliwangi in Bandung, last week. "So the improvement will be tailored to the needs of veterans," said Aas. In addition to Veterans House Surgery, there are several series of State Owned Enterprises for the State 2017 activities such as Student Know Mengenal Nusantara, Healthy Walk and Ceremony Ceremony RI 72th Anniversary. Deputy Minister of Mining Business, Strategic Industries and Media Ministry of State Enterprises Harry Sampurno said, the series of activities to commemorate the 72nd anniversary of Independence of RI is one of the SOEs' commitment to attend the country. "In this case, I am proud of the shoulder-to-shoulder effort undertaken by PT Pupuk Indonesia (Persero) PT Berikat Nusantara (Persero), Sarinah (Persero), PT Jakarta Industrial Estate Pulogadung (Persero) and PT Perusahaan Pengelola Aset Persero) in realizing the series of activities to commemorate the 72nd anniversary of Independence of RI, "said Harry, on the show Jalan Santai 'Langkah Untuk Negeri'. Also attending the event was Healthy Deputy Minister of Mining Business, Strategic Industries and Media Ministry of SOEs Fajar Harry Sampurno. Harry added that, as stated by SOE Minister Rini Soemarno in the last two years, the purpose of the SOE program is Attending to the State in addition to get closer to the community, also to get the aspirations to be supported by SOEs going forward. "Especially in the anniversary of August 17, in every province in Indonesia, each SOE company gets the task and responsibility in coordinating its activities, especially in Jakarta, there are five SOEs coordinated by PT Pupuk Indonesia," said Harry.